Based on purchase price of $399 at 0% APR for 18 months. Excludes tax and shipping fees, to be calculated at checkout. Rates range from 0-30% APR. Choose from 6, 12, or 18 monthly payments. Vactrol-based 6-input, 3-output macro-lowpass gate and signal crossfader, based on Grant Richter’s circuit idea for applying “cadavre exquis” (aka exquisite corpse, a technique of serial blind composition) to modular synthesis. If modulated by a Wogglebug, one will achieve modular “cadavre exquis.” If patch programmed using a sequencer such as the Pressure Points/ BRAINS or René, modular “mélange automatique” (automatic re-mixing) could be achieved. 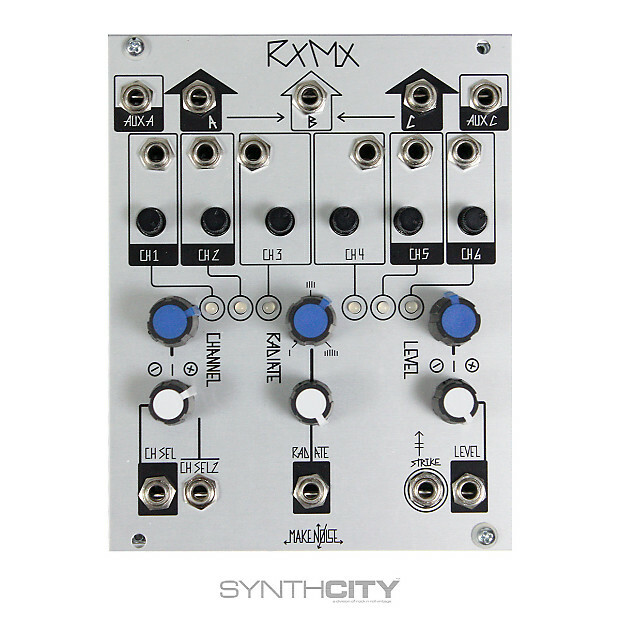 The Level and Strike parameters are similar to those of the Optomix where Level is controlling amplitude and frequency content simultaneously and Strike triggers the LPG (Low Pass Gate) circuit by “plucking” or “pinging” the vactrol, thus allowing it to impart its magically slow response time upon the amplitude of the signal being processed. The Channel parameter selects which of the 6 Low Pass Gate circuits is driven by the Level and Strike parameters and the Radiate parameter turns on channels adjacent to the selected channel. At maximum Radiate settings all six channels become active simultaneously. Radiate therefore allows for voltage control of the complexity of the mix ranging from 1 to 6 active sound sources, while Channel selects the focal point of the mix. International Buyers – Please Note: Import duties, taxes, and charges are not included in the item price or shipping cost. These charges are the buyer's responsibility. Please check with your country's customs office to determine what these additional costs will be prior to bidding or buying. Customs fees are normally charged by the shipping company or collected when you pick the item up. These fees are not additional shipping charges. We cannot under-value merchandise or mark the item as a gift on customs forms. We are happy to answer any questions you might have so please contact us about any concerns prior to purchase. Many of our items are used or vintage and come as they are pictured. Do not assume accessories are included if they are not mentioned or photographed. Damaged and Defective Items: At our discretion we will either replace, repair or provide a refund for damaged and defective items. Proof of damage may be required. Please contact us for details. We must be notified within 48 hours of receiving a damaged or defective item. item with "FREE SHIPPING." If it actually cost us $50 to ship out an item, that cost will be deducted from the refund. The customer must pay all shipping and insurance when sending an item back to our store. We do not consider the guitar or amp returned until we have received the item and verified it's in the same condition as shipped. Any accessories must also be returned in original condition. For all new items, accessories such as hang tags, manuals and protective covers must be included and in their original condition. Pedals and Accessories Returns: Pedals and accessories may be returned for up to 14 days after receipt of the product. All packing material, instructions and parts must be included and the product must be in new condition or an adjustment to your refund will be made. Please contact the store before returning any pedal or accessory. Guitar and Amp Returns: Guitars and Amps have a 48 hour approval period. The approval period starts upon delivery. The customer must notify us of a return within 48 hours of receipt. Please call 773-878-8616 or drop us an email to notify us within the 48 hour approval period. Please contact the store before shipping the item back. We will provide return shipping instructions. 15% restock fee will apply to any opened sealed non-defective products. This fee will be deducted from your refund.